New Chapter Zyflamend Nighttime at Bodybuilding.com - Best Prices on Zyflamend Nighttime! 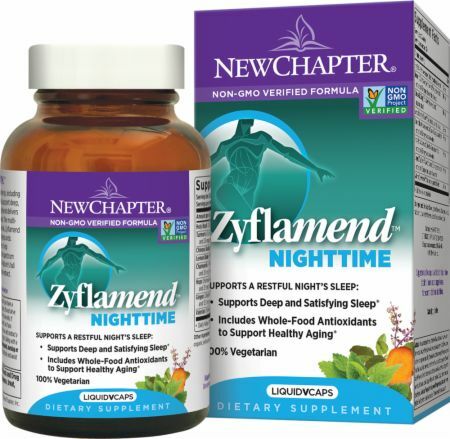 Zyflamend Nighttime’s proprietary herbal blend delivers the full-spectrum of whole herbs, not isolated compounds. The multi-herbal that may be as important as your daily multivitamin, Zyflamend Nighttime delivers a multitude of naturally occurring compounds. No Zyflamend Nighttime Reviews Found. Extra-Virgin Olive Oil, Hypromellose (capsule), Organic Olive Oil, Maltodextrin, Organic Yellow Beeswax, Candelilla Wax, and Silicon Dioxide. Directions For Zyflamend Nighttime: Two capsules with food one hour before bedtime. Do not exceed suggested use. Not recommended for use in children. Warnings: As with any dietary supplement, contact a healthcare professional if you have a long term medical condition, take regular medication or are planning surgery. Do not drive or operate machinery or equipment after taking this product. For short term use only. If sleeplessness persists beyond two weeks, if you experience an adverse event, or if you develop symptoms of abdominal pain, dark urine, or jaundice, discontinue use and contact a healthcare professional. Supplements are not a substitute for medical therapy. Taking with a meal and a full glass of water may reduce stomach upset. Do not use if pregnant, nursing or considering pregnancy. Keep out of reach of children. Read ingredients carefully and avoid use if known sensitivity to any ingredient.